For many years internally Woolworth described gardening as "the Manager's Department". Turning a profit from items that grow requires skill and judgement. Most plants and trees naturally grow out of doors, sustained by sunlight and rain from above. Artificial light and metal shelves make for a much more hostile environment. To look good and sell well, they need regular love and care. 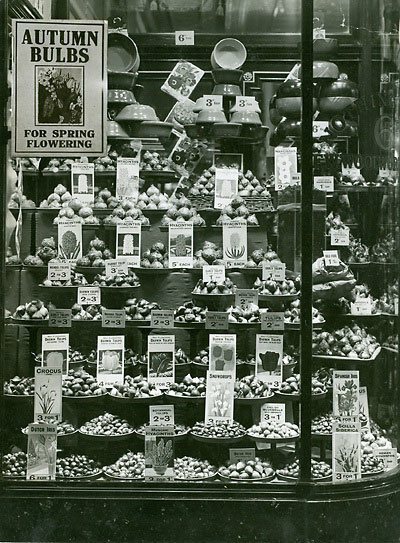 In days gone by Woolworth Managers learnt about the growing seasons, and became experts in what to stock when. This helped to fulfil demand while also achieving a good profit. Many executives built their careers, and earnt handsome bonuses by mastering 'horti', or in full the Horticulture Department. In the early days it was considered a rite of passage to the upper echelons. But more recently only the old-timers really got it, as newcomers struggled to keep the plants alive. This page tells the story of one of the great survivors of the Woolworth range. It still keeps the gardens of every US state looking 'blooming good' twenty years after the last 5¢ & 10¢ pulled down the shutters for the last time, and can still be seen in the beds and borders of many an English Country Garden, Scottish glen or Welsh mountainside. And the best amateur Irish growers still dig crops of potatoes loving brought on from the rare varieties originally purchased at Woolies a generation ago. As you will see, in its heyday the range took over the stores, with huge displays in the Spring and Autumn. It 'grew' during World War II, powering the 'dig for victory' that kept families fed on the Home Front during the darkest days, before giving several experts from BBC Radio's hardy perennial GQT ("Gardeners Question Time") a second income, and a further chance to beautify the UK. 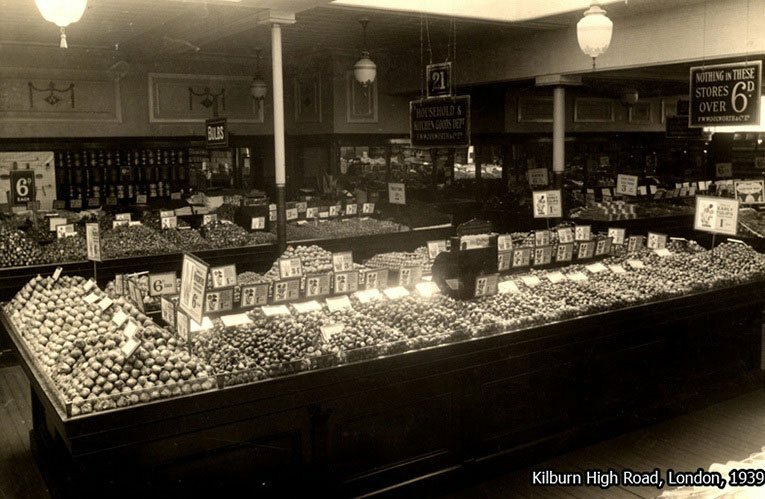 The stores sold flower bulbs, shrubs, plants and seeds for ninety-nine years. To this day, squirrels notwithstanding, it is estimated that one in three daffodils and tulips in bloom each Spring across the UK originally came not from a Garden Centre but from the heart of the High Street. Before World War II bulbs and shrubs were sold loose, rather than in packets. Daffodils and tulip bulbs were one old penny each (½p), rosebuds (grafted small twigs of rose bush) were three pence (1.25p) and hybrid bulbs like prepared hyacinths were five pence (2p) each. Tiny bulbs like crocuses and muscari were three for a penny (7 for 1p). Then, each September, bulbs, shrubs, plant pots and bulb fibre displays 'grew' to almost a sixth of the huge chain's selling space. During World War II F.W. Woolworth powered the 'Dig for Victory', as families replaced their prized lawns and flower borders with beds of seed potatoes and vegetables to keep Britain fed. When peace returned the gardeners chose the High Street stores for their market-beating selection of seeds, shrubs, roses and garden tools at prices that nurseries couldn't match. In the 1980s new owners reinvigorated the gardening offer to combat the advent of Garden Centres, keeping the stores ahead. The retailer was feted by the Royal Horticultural Society. Its gardens won coveted gold medals at five successive Chelsea Flower shows. The leading grower Harry Wheatcroft, a long-time friend, celebrated the accolade by naming one of his most beautiful hybrid tea roses "Chelsea Gold". A rival supplier later followed suit with a Floribunda aptly baptized "The Wonder of Woolies". To mark their continuing challenge to out-of-town competition, the Board commissioned signs for the stores describing them as "The Garden Centre in your High Street", with deeds matching the words as sales and profit remained buoyant. New leaders in the 2000s were less green-fingered. The space allocated to the range was drastically reduced after the stores left the Kingfisher Group. 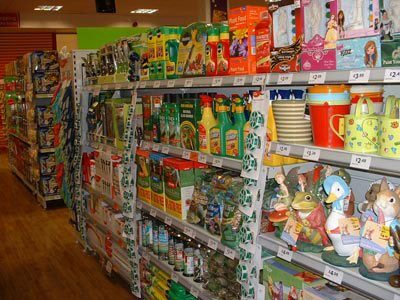 While company bosses were happy to bank the profit from sales of growing gardening, and found ways to work around the weakened skills base in-store, their inexperience led to poor decisions about the product selections for seeds and garden chemicals. Despite this a succession of young Buyers were able to build new markets, attracting a new generation of school age gardeners with project kits and garden ornaments. Their skills will live on like the blooms in gardens across Britain, which are testimony to happier times in the High Street. 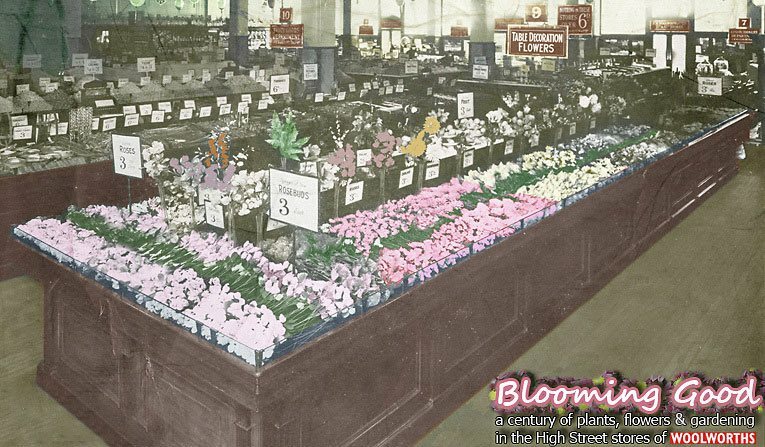 In the 1910s and 1920s many Woolworth customers didn't have a garden, just a small back yard or a simple window box. The retailer aimed to help them to create a splash of colour, or to grow a few vegetables despite the restricted space. Leaflets explained how to achieve the maximum yield. Many of the homes that were built in suburbs in the Thirties had a little land of their own. In some areas a new semi-detached house with electricity, running water and a small garden could be purchased for just £200. Woolworth went to great lengths to attract the new households, pitching stores nearby and cramming them with tools, brushes, utensils and floor coverings for indoors complemented by a selection of shrubs, plants and bulbs to perfect the outside space. By 1930 Woolworth dominated the gardening market. It sold millions of packets of top-name vegetable and flower seeds, packed for them by Bees and Carters. With little competition the stores devoted space near the front entrance to maximise sales. There displays included pots and trays for growing the seeds, along with fertiliser and compost, which staff called "bags of dirt". A small bag, containing enough for a single seed tray was just one penny, or there was one four times larger for threepence. The Buyer used to joke that he "cultivated" his suppliers. The tight-knit group earned big orders by remaining loyal. They favoured the High Street chain because in a volatile, seasonal market, it agreed to place its main order a year in advance, helping them to plan production. The stock was delivered by train. Shortly after Christmas the national rail network carried whole carriages of seed potatoes and onion sets to the major stores, along with large wooden crates crammed with packets of seeds, and huge sacks of peat and compost. In the South, with its milder climate, Store Managers cherry-picked the shipment to get everything on sale at once, while in Scotland and Northern England they waited for a Carter Paterson man and van to deliver them over the last leg over the following week. As winter turned to spring the whole process was repeated to distribute roses, shrubs and plants. 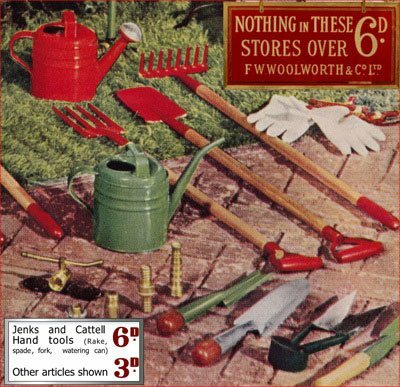 Jenks and Cattell of Wolverhampton made a popular range of garden tools, which were stocked in every branch. The forks, spades and rakes were just sixpence. Despite the low price they had wooden handles and distinctive scarlet red blades, and generated a penny (16.67%) in margin. Matching trowels were just threepence, and dibbers a penny. At today's price the large items would be just £2.11. Close co-operation ensured a steady supply of healthy shrubs and plants from the nurseries of Eastern England, while the Buyer was also a regular traveller to Holland to tune the range of flower bulbs. 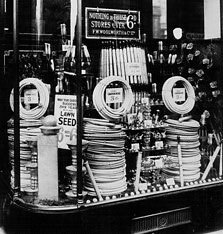 Other Thirties best sellers were rubber garden hoses for threepence, loose grass seed at 6D for 6 ounces (about 15p/Kg), and picket fencing for sixpence a yard (3p/metre). Bosses liked the window display at Church Street, Liverpool so much they had it photographed. Postcards of the snap were distributed nationally so that the 400 other stores could copy it. 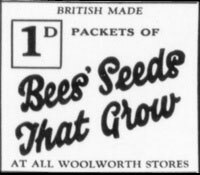 In 1937 tuppenny packets of Cuthbert's seeds, quickly overtook the long-established Bees brand. Sales were driven by the bright packaging, which used the latest printing technology to incorporate colour photographs of the fully-grown plant. R. & G. Cuthbert went on to become the largest gardening supplier, enjoying a seventy-one year partnership with Woolworth. Just weeks after staff in Kilburn laid out their Autumn Bulbs (shown above), Britain declared war on Germany. Over the following year prices rose rapidly, forcing the end of the stores' longstanding sixpenny price limit. The Buyer showed great ingenuity in adapting bis range. Predicting what would happen, he packed the stores with vegetable plants and seeds, and all the fertilizers and chemicals he could get hold off, ensuring that the stores were in at the start of the nation's "Dig for Victory". Everyone with a garden was asked to grow food, as a sea blockade prevented imports. 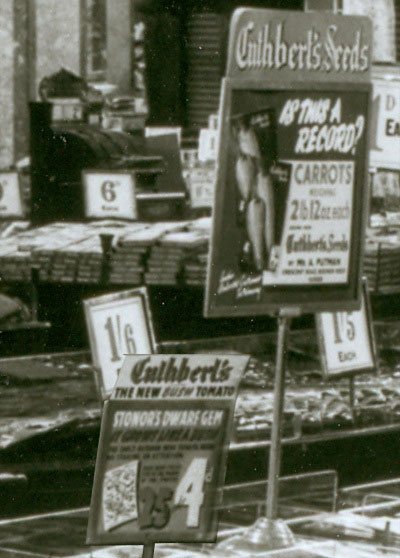 Woolworth and its leading supplier, R. & G. Cuthbert, worked tirelessly with the Ministry of Food to inspire a generation of home growers. When peace finally returned rationing was tightened. Austerity measures were implemented to boost exports and curtail imports, as the Government sought foreign exchange to pay off the huge debts that had been incurred under Roosevelt's lend lease scheme in 1939-1941. Families continued to grow beans, carrots and potatoes where their lawns and flower beds had stood. 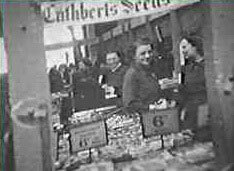 Many bought from Woolworth's, where bright red signs promised high yields from every pack of Cuthbert's seeds. Instead of sticking with old varieties, some shoppers tried a touch of the exotic with the new 'continental' lines, pitched to the servicemen returning from the war in Europe. 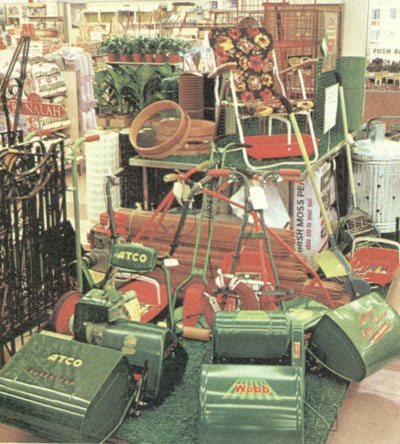 Each Spring the gardening range was given pride of place, with up to a quarter of the total counter space in-store. Clever marketing meant that prices were held down on seeds, as a gesture of support for working families. In other parts of the store they had risen up to seven-fold since the outbreak of War. In 1949 the austerity measures were progressively phased out, allowing flower seeds, shrubs and rose bushes to make a welcome return to the shelves after an absence of ten years. A new generation of gardeners set their sights higher. The Buyer quickly spotted the impact that a popular radio programme was having on the tastes of his customers. A panel of experts on "How Does Your Garden Grow?" extolled the virtue of cloches, potting sheds and greenhouses to bring on seeds and tender plants, extending the growing season. Despite the show initially being broadcast only in Northern England and Ulster it prompted a craze of installations right across the country. Seeing the influence of "experts", the Buyer decided to "grow his own". He approached Fred Streeter, who had advised Woolworth about the wartime Dig for Victory and had first appeared on the BBC Home Service in 1935. By the 1950s he had become quite a superstar, featuring in TV broadcasts from the Alexandra Palace Garden, as well as being the Radio Gardener on the Home Service's "In Your Garden". Under Streeter's guidance the company gave away small booklets to shoppers, introducing the novice gardener to the wonder of growing seeds, planting bulbs and laying a lawn. The booklets were funded by supplier advertising, with Bees Seeds and R. & G. Cuthbert going head-to-head, along with Dobie's, Phostrogen and H. Prins of Wisbech. One was endorsed by "Fred Streeter, the BBC Gardener". Over time more experts were enlisted. Perhaps the most influential was Clay Jones of Cuthbert's. In the late Fifties he was commissioned to produce a manual for store staff. His "Handbook for the Horti-girl" (later renamed "The Gardener's Year"), which was updated annually, became essential reading for Store Managers as well as sales staff. Nicknamed "the Bible", its timelines and charts helped to adjust the displays week-by-week to match the growing season in different areas of the country. In a twist of fate, Jones went on to chair the very show which had originally sparked Woolworth's desire for its own experts. He became the much-loved host of the popular Gardeners' Question Time show, which remains a hardy perennial of BBC Radio 4's output to this day. The leaflets and endorsements were Woolworth's response to an increasingly aspirational clientele. People began to take much greater pride in their homes, whether owned or rented, reinstating the lawns and replanting the borders with flower seeds, but following the tips to beat the yields they had achieved in wartime despite allocating a much smaller space to the vegetable patch. As well as stocking better-cropping varieties, the stores strongly promoted fertilizers like Photostrogen and Plantoids, as well as exclusive composts and preparations made for them by R. & G. Cuthbert. Some were sold under the diamond 'W' house brand, and others under the Cuthbert name. In the 1960s the range expanded as the stores grew larger. Some city centre branches created a gardening 'shop within a shop', copying elements from the new out-of-town Woolco subsidiary. As the new offer took shape it was a far cry from the sixpenny days. Most of the items added to the range were at much higher prices. They were targeted at affluent gardeners who were prepared to invest to make the mundane tasks easier and to beautify their gardens. There were displays of wrought iron gates, Atco Petrol Mowers and aluminium Crittall Greenhouses. These could be bought on credit through Woolco's new chargecard scheme, which was soon extended to Woolworth. Throughout the Sixties and Seventies the stores sold increasing numbers of bedding plants, one of very few ranges which Managers were allowed to buy locally. Many of them built a relationship with a nursery nearby and visited regularly, selecting their favourites and taking them to their stores by car. An increasing number of shoppers also had access to a car. These visits to nurseries encouraged some of the outlets to morph into Garden Centres, a phenomenon which presented a new challenge to the High Street. 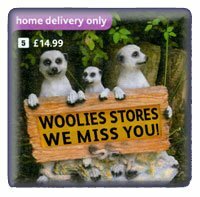 Woolworth responded with a marketing campaign which highlighted its lower prices and more convenient locations. Despite the bravado, in 1976 it embraced the idea. Stores were surveyed to identify those with outside space which could be made into a Garden Centre, after a successful trial in Peascod Street, Windsor. Where potential was identified, two-tone cream and green paving was laid in the back yard, and flower beds and tables were constructed as a show space for shrubs, plants and accessories. The natural light helped to keep the plants in peak condition and made watering easier, as well as creating an effective and pleasant sales environment. As the Board began to recognise the importance of good public relations, both to boost sales and to keep investors happy, gardening was identified as a key strength. It was able to leverage its long relationships with celebrity gardeners to make its mark. The highest in land, Queen Elizabeth II, appeared to like the company's award-winning garden at the Royal Horticultural Society's Chelsea Flower Show. But, behind the scenes, executives knew that the offer was getting tired, and that despite their competitive prices they were losing trade as shoppers headed out of town. To redress the balance, the Chairman, Geoffrey Rodgers, proposed to found a new chain of out-of-town DIY stores, which would also sell gardening. Rather than build from scratch, he subsequently went on a spending spree, acquiring a small, independent chain called B&Q, which he considered a rising star. The much-heralded and highly controversial move is thought to have brought on a much radical shake-up for the chain, as it inspired a group of investors to wrest control of the UK business in 1982. Major changes were to follow. The new owners took a long, hard look at the business, eliminating many of the established ranges and specialising in six areas of particular strength. One of these was 'Home, Kitchen and Garden', prompting a full-scale makeover of the horticulture offer. Learning from the success that R. & G. Cuthbert had enjoyed almost fifty years earler, product packaging was improved, with carry-handles and lifestyle photographs of each full-grown plant. The heaviest and most expensive items, like motor mowers and greenhouses, were eliminated from the High Street, recognising that customers would find it much easier to carry these home from B&Q's convenient car parks. Agreement was reached with Cuthbert's that all own label lines would carry their name, and that the smaller branches with limited space would give these lines priority over supplier brands. While some were made by the Llangollen-based supplier, Jenks and Cattell continued to manufacture the tools, and garden chemicals were still sourced principally from ICI and Pan Britannica Industries (PBI). Despite the more elegant look for the gardening section, many prices were lowered. Leveraging the combined buying power of Woolworth and an ever-expanding B&Q, better deals were struck for shrubs, plants and fruit trees, and both chains sold Spear and Jackson Neverbend tools at under half of the recommended retail price. The new management had successfully harnessed the best of what they had found, retaining and motivating the long-serving and highly skilled Buyer, Peter Ward, while adding external perspective about margin management and customer price perception. Rather than trip over the daisies, the Board wisely concentrated on getting the core offer right, while allowing those Store Managers who operated outside Garden Centres the latitude to shape the offer for themselves. The leading rose expert Harry Wheatcroft, long a member of the Buyer's panel, was a key adviser on the gold medal winning gardens at Chelsea. He celebrated his fourth successive annual win in 1987 by grafting a special rose in the Company's honour. The beautiful Hybrid Tea "Chelsea Gold" proved a hit with the public too, outselling every other variety. Despite a further gold medal the following year, the veteran faced an undeserved slight when an external adviser pushed for his picture to be removed from the packaging of his rosebushes. The so-called marketeers reported that a number of customer panels had highlighted "the old bloke's mutton chop sideboards" as a major barrier to purchase. Wiser counsel might have been to shrink the over-sized, tightly-cropped headshot depicting Wheatcroft's handlebar moustache, to make space to enlarge the photo of the beautiful rose inside the packet. Once implemented the change boosted sales of the rival own-label brand grown by H. Prins of Wisbech at the expense of the superior line it was supposed to support. H. Prins later took a leaf out of Wheatcroft's playbook. In 1995 they presented the Buyer with an elegant floribunda, with dainty orange blooms and a delightful scent, which they had baptized 'The Wonder of Woolies'. Despite continuing good sales, gardening profit started to fall during the 1990s. The chain had successfully confronted Garden Centre competition, but had started to face a new threat. As supermarkets sought to broaden into general merchandise, they had targeted seeds, seasonal shrubs and rosebushes as the low-hanging fruit, particularly in their large out-of-town superstores. Research showed that customers rated the Woolworths offer to be much better value and of superior quality, but that the High Street location of its stores was simply not as convenient as the smooth run with a trolley to the car offered by the grocers. This proved much harder to tackle. But the decline in profit had a more deepset cause. Far more plants were being thrown away, or sold at cut prices after their condition had deteriorated. In earlier times the Company had relied on its Store Managers to cherish the displays. But cultural changes meant that younger Managers hadn't inherited the love that their predecessors had felt for "Horti". In recruiting only graduate trainees, Kingfisher Group had shortened the training time, and had fostered a more hands-off approach to everyday tasks. 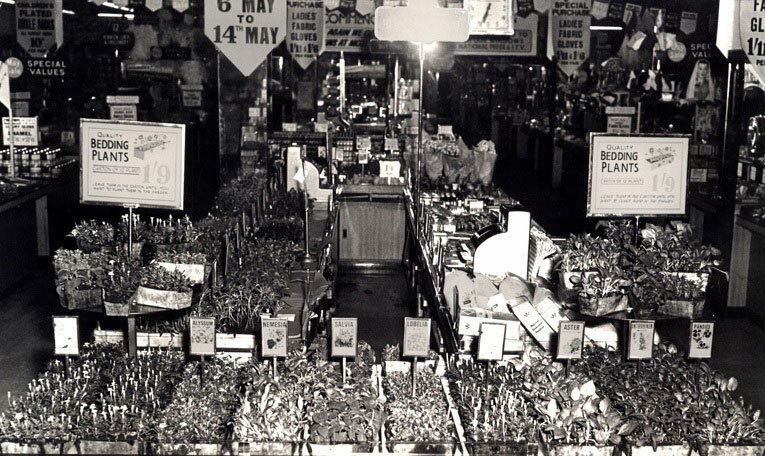 While older Managers continued to adopt the department and keep the displays looking good, maximising full price sales, the new blood did not. Some were lucky, inheriting dedicated gardening staff. But in many stores a day's neglect, without watering and rotating the stock, was all it took for the plants to wither, requiring deep price cuts to persuade shoppers to attempt a rescue. To compound the problem, major supermarkets targeted the stores with the best plant displays. In some cases they were able to pay people more to be a department manager, with only limited responsibilities, than they had earned as Store Managers with the weight of the world on their shoulders. They also set their sights on the team at Head Office. In the final fifteen years in the High Street, the chain got through no less than fifteen Buyers and Assistant Buyers for Gardening, as one after another made tracks for Cheshunt, Stamford Street, Leeds or Wakefield. The Founder, Frank Woolworth, only endured what he called "such treachery" on less than a dozen occasions in his forty years at the helm. After the millennium the break-up of of Kingfisher brought fresh perspective to the gardening offer, as new leaders hired from outside reshaped the chain. The space allocated to the range was severely pruned to make way for a bigger offer for children. In cash-strapped times Buying effort went into making the range less labour intensive, as a new generation of executives sought to find a way to keep plants alive for long enough to sell them. The new offer included a small selection of fertilizers and plant care. After more than sixty years the Cuthbert name was dropped. Inexperienced executives, perhaps unaware of the legacy and the lasting love that customers retained for the name, argued that since R. & G. Cuthbert had been bought out by Suttons Seeds, and had moved from Llangollen to Torquay, there was no benefit in stocking both marques of seeds, and that Suttons was the 'trusted' name. They also believed that people would prefered the leading makes of garden chemicals and compost. Dozens of letters from keen gardeners regretting the passing of the Cuthbert brand received stock answers explaining simply that "times change". There were successes too. The Buyers rose to the challenge of finding products that would appeal to the new target customer, an aspiring mum with young children. Kids Growing Kits were a big hit, selling all the year around, both for school projects and as Christmas stocking fillers. The top lines were starter packs of mustard and cress, and other out-of-the-box salads and vegetables. Children also adopted lots of garden gnomes and character figurines. They surprised the Buyer by favouring "paint your own" kits, rather than the finished articles. 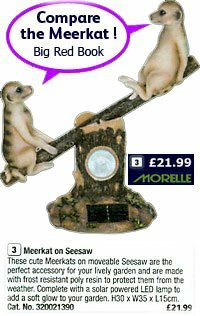 Happenstance brought Meerkat figures into the range just before a certain website began to compare the market. When asked how he had achieved such high sales, the Buyer's semi-ironic retort was "simples"! Sales of packet shrubs and rosebushes also grew, as gardening was presented as a family project. Varieties of fruit bushes and trees were chosen for their kid-appeal. Executives found it hard to believe when the new ranges. which had been repackaged into airtight packs with a small ball of soil around the roots, sold out quickly, before even coming into season. The Buyer's pièce de resistance was a roll-on roll-off central service for bedding plants. The scheme, dreamt up with a leading supplier, tackled the problem of stock losses in the stores. Plants were delivered on tall shelved trolleys which became the counters. Where possible stores were advised to place these on the doorstep outside, in the porch space originally designed for parents to leave infants in prams to 'take the air' in the distant days when perambulators were banned from entering the stores on Fridays and Saturdays. The outdoor location made the plants easier to water, while the sunshine kept them in tip-top condition. The supplier developed the knack of sending plants just as they were ready to burst into bloom, giving them instant kerb-appeal. The miraculous turnaround, which restored sales to levels not seen for twenty years, was acknowledged by a new popular catch-phrase in-store - "Thank Heavens for H-Evans". A new catalogue 'The Big Red Book' and an enhanced website heralded a return of many of the larger items which had last been sold at Woolco before the Kingfisher takeover. Power mowers, strimmers and hedgetrimmers all sold well. 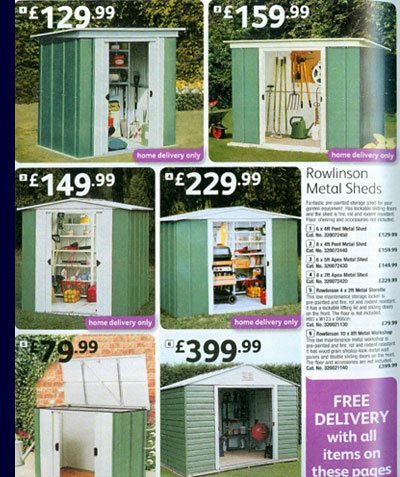 The surprise hit was a range of garden sheds, which proved particularly lucrative. Bumper sales were achieved without the need to carry the stock, using the catalogue to refer shoppers directly to the supplier, who arrange delivery and, if they wished, installation. The vendor paid hansomely for each lead. While the latter day gardening offer was only a shadow of the glories of earlier times, despite cynicism at Board level, a succession of 21st Century Buyers beat the odds, to establish a niche for gardening at Woolies, which illustrated the enduring power of the brand, and the convenience of the High Street locations for Mums picking up their kids from school. They established a good platform to build on, and had developed plans to exploit it further, when 'force majeure' intervened. As the stores entered peak trading in 2008 the Group ran out of cash, after dwindling profits in the High Street had failed to maintain the reserves needed by the increasingly hungry wholesale entertainment division. Within days the shutters fell and an icon vanished from the High Street. To this day, the evidence of Woolworth's influence on British gardens lurks in plain sight. Beds of daffodils and tulips, thousands of Azeleas, Camelias and Fruit Trees burst into life each Spring, blossoming and blooming to bring colour to our lives, and forming a lasting memorial to the much loved stores that did so much to brighten Britain over their ninety-nine years in the High Street.